Improved resistance management. Regalia PTO’s multi-site activity andcomplex mode of action makes it difficult for diseases to develop resistance. A superior alternative to chemical fungicides, Regalia PTO should be used as part of an integrated disease management program to reduce the risk of pathogen resistance. Click to see how it works. 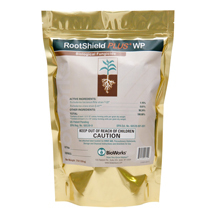 Biological fungicide for root disease control. Grows on roots, "shielding" them against root-damaging fungi. Controls up to 12 weeks. Preventative control of major root diseases including soilborne Phytophthora sp. 0-hour REI*, 0-day PHI OMRI listed. Triact 70 (clarified hydrophobic extract of Neem oil) is a broad-spectrum fungicide, miticide and insecticide (OMRI listed). This highly effective and economical botanical oil may be used indoors as well as outdoors on ornamental flowering plants, trees, shrubs and foliage grown in greenhouses, interiorscapes and commercial landscapes. As a fungicide, Triact 70 is a preventative as well as a curative. It coats fungal spores and then dehydrates them to stop the disease cycle. Use Triact 70 when conditions favor disease development but before major symptoms occur. As a miticide and an insecticide, Triact 70 acts as a suffocant. To ensure maximum control thorough coverage of Triact 70 is key. Use Triact 70 at rates of 0.5 to 2 percent at spray intervals of 7 to 10 days. Triact 70 makes an excellent tool for all well developed IPM programs. 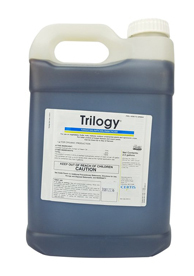 Trilogy is a botanical fungicide / miticide that controls a wide range of foliar diseases and selected mite species. It's active ingredient is clarified hydrophobic extract of neem oil. Trilogy is compatible with the environment and its inhabitants. Field workers can re-enter treated areas after only 4 hours. Trilogy also has a 0-day pre-harvest interval - it can be applied up to and on the day of harvest. This product is approved for organic production by the National Organic Program (NOP), a marketing program housed within the United States Department of Agriculture (USDA) Agricultural Marketing Service, the agency that sets marketing standards. The NOP mission is to develop and implement national standards that govern the marketing of agricultural products as organically produced, to facilitate commerce in fresh and processed food that is organically produced, and to assure consumers that such products meet consistent standards. Usage is 2.5 tablespoons per gallon of solution.